The warm, woody and camphorous scent of Patchouli essential oil is loved by many. It is known for its regenerating and anti-inflammatory properties. In addition to its haunting smell, it acts as a venous tonic to stimulate blood circulation. 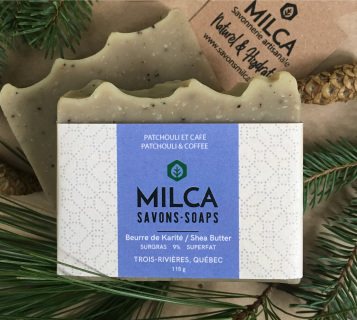 Added with ground coffee beans, this very aromatic soap exfoliates gently and eliminates the most stubborn odors. Contributes to the relief of problems such as eczema, mild acne and rosacea. Renowned for its great virtues, honey has many softening and antioxidant properties. It is, moreover, a natural humectant, an antiseptic and a healing agent. It protects the skin from dehydration, especially in winter. Oats, rich in fatty acids, come to soothe, soften and nourish sensitive and irritated skin. Suitable for any skin type! The virtues of activated charcoal in cases of oily and acne prone skin are well known. It is a very effective purifier and detoxifier. 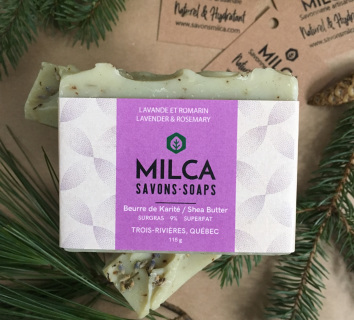 Combined with our blend of tea tree, lavender and rosemary essential oils, this soap is a wise choice for cleansing. The use of activated charcoal gives conclusive and rapid results since it adsorbs toxins and bacteria responsible for several skin problems. Our oils carefully selected for their moisturizing and non-greasy properties, as well as active additions such as green clay will cleanse your skin. A very mild soap despite its robust appearance! 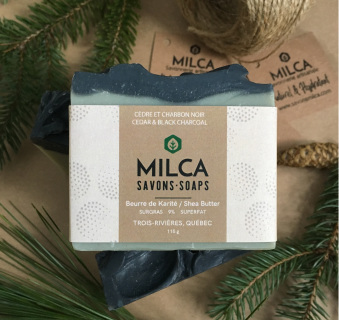 This mild, purifying soap has a fresh scent. The white clay it contains brings cleansing and purifying qualities, leaving a beautiful softness on the skin. The touch of activated charcoal comes to marry perfectly with its absorbing and detoxifying properties. It is increasingly used in the routine of skin care thanks to its great virtues. 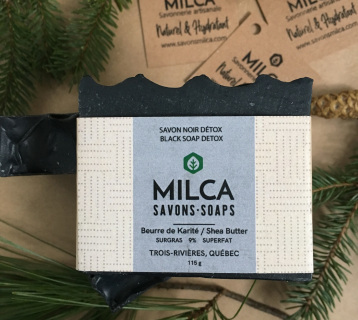 If this soap is loved by men for its purely natural scent of Canadian cedar, women also love it for its efficiency and softness! Goat milk is particularly beneficial to sensitive skin. Natural product used for a long time in soap, goat milk has a unique composition to which we owe its exceptional properties. It remains, even today, one of the best ingredient to moisturize and gently nourish the most sensitive skin. With a composition of three clays; white, green and pink, this soap provides maximum benefits. The warm and slightly sweet fragrance of the essential oil of benzoin will charm you. Pretty poppy seeds crown this classic soap to bring a light exfoliation. This fragrant soap with a harmonious blend of lavender and rosemary essential oils is filled with relaxing and soothing properties. The innumerable virtues of the essential oil of lavender are found in this soap very soft for the skin. White clay is added for its softening, healing and cleansing qualities. In addition to being very moisturizing, it soothes itching and very dry skin. Light exfoliation with ground rosemary sprigs. Suitable for all skin types and ideal for frequent use. Pure moment of relaxation and well-being! This gentle moisturizing soap gives off a refreshing scent thanks to the essential oil of lime. Green clay is an extraordinary natural ingredient. We no longer count its benefits. It is purifying, remineralizing, healing, detoxifying, in addition to regulating the secretion of sebum. This soap cleans and naturally rids the skin of impurities, making it an exceptional choice for normal or oily skin. Also effective for occasional facial care. A pure and effective soap! This odorless soap has been designed for babies, pregnant women who do not want to use essential oil, people struggling with any skin problem (eczema, psoriasis, irritation ...) or simply for all those who prefer a fragrance free soap! Aloe vera is a plant known for its many virtues. It provides revitalization for damaged skin. Aloe is particularly useful for protecting the skin against external aggressions (pollution, UV ray, etc.). This soap will be suitable for all skin types. Ideal for delicate and sensitive skin thanks to several of its active compounds (vitamins B1, B2, B3 and B6, calcium, potassium, magnesium etc.). 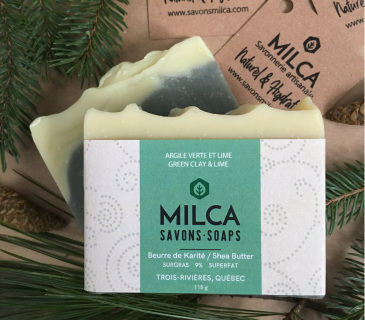 This mild, purifying soap has a fresh and bright scent. 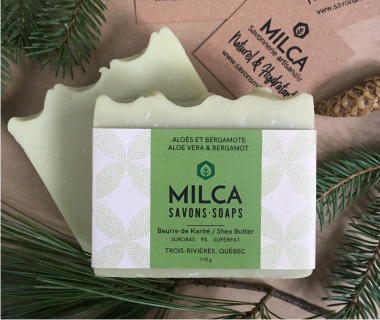 The essential oil of organic balsam fir opens the door to the forest and its sublime fragrance. A seasonal soap in limited edition! Formula specially designed to feed and strengthen the dog's fur. With the addition of neem oil, this soap is very effective in repelling parasites, fleas or mosquitoes. Nourishing and emollient, it improves sensitive skin. Also, this soap makes the fur soft, shiny and strong. The synergy of added essential oils reinforces the action of neem oil to keep away unwanted insects. No coloring or chemical additives - Biodegradable - Palm oil free. 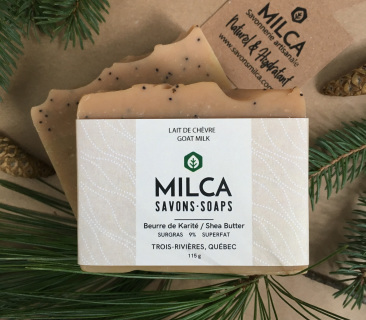 A luxury treatment for your favorite companion specially designed by MILCA. This massage bar exudes a delicious chocolate scent thanks to the organic and fair undeodorized cocoa butter. Our recipe contains only three exceptional ingredients. Created to melt with the heat of the skin, rub it in your hands or directly on the area to be massaged. Simply apply the desired amount and repeat as many times as your heart tells you! Gone are the oils that flow and leave stains. Our white chocolate heart is an excuse to pamper loved ones in your life, big and small. Wonderful for the skin and safe for the environment. This reversible soap dish made of cedar wood is made by the company Rabot D. Bois in Rimouski, Qc. It allows the soap to dry between uses and thus maintain its hardness and extend its life. Hollow grooves let the water run while keeping your counter clean. It can be washed occasionally to remove soap accumulations with a brush and a little water. Each copy is unique with variations in hues and sometimes knots. This konjac sponge is made of 100% pure and natural konjac powder. Made to exfoliate the face, it is incredibly soft and perfect for the most sensitive skin. 1. Wet the sponge in hot water and allow it to expand. 2. Squeeze gently to remove excess water. 3. Exfoliate the skin of the face by making circular movements. 4. Rinse and wring out after use. 5. Hang or keep dry in a ventilated area to allow the sponge to dry between uses. Ghana Shea butter. 100% pure. This treasure of nature nourishes, moisturizes, protects and soothes skin irritations. Melt in the palm of your hands before applying to any dry area. A small amount of shea butter in the bath will leave a thin film on all the skin: softness guaranteed! The ally par excellence to face the rigors of winter as well as excess sun. Organic lip balm. Perfect mix, neither too sticky nor too soft. It helps to protect and regenerate the lips during cold winter weather. Our silky and ultra moisturizing lip balm is made of the finest ingredients. The non-deodorized cocoa butter gives off a delicate, natural chocolate fragrance! This konjac sponge with activated charcoal is made of 100% pure and natural konjac powder. 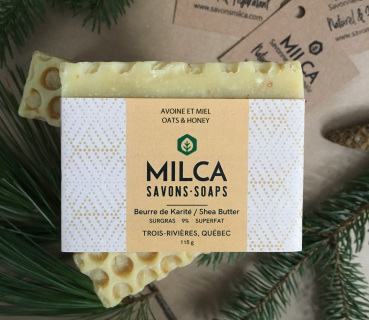 These washable cleansing wipes are created and handcrafted in Quebec by Lena and Gabi. An eco-friendly alternative to disposable make-up removers, they help reduce the amount of waste on a daily basis. The soft polyester backing is ideal for removing make-up from the eyes and its dark color has been chosen to resist mascara stains. Use the dark side preferably for mascara. Machine wash, in a garment bag (with dark clothing to avoid makeup residue on light clothing). Avoid the use of fabric softener and bleach. This pink clay konjac sponge is made from 100% pure and natural konjac powder.